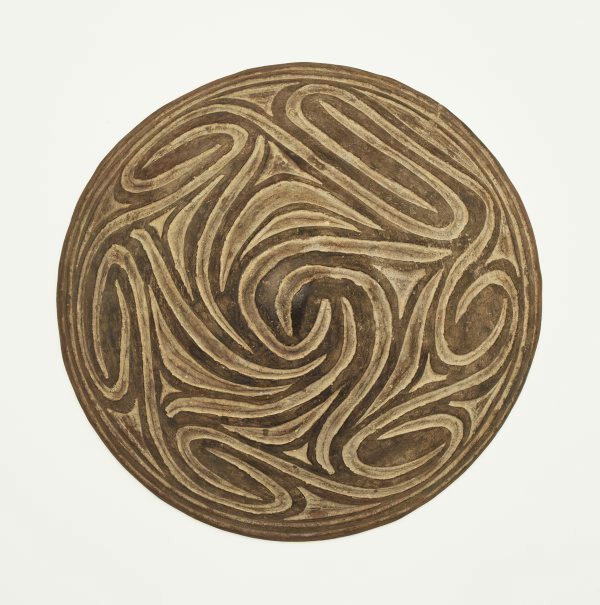 The design carved across the surface of this 'kámané' is said to represent a 'wangi' (eel), a totemic animal probably associated with the owner's clan. When a feast is held, visiting clan members can be identified by the clan totem displayed on the 'kámané' brought by the owner. The 'kámané kipma' (fine clay) used by Kamangaui potters is sourced from an area known as Wimbo, according to Gabriel Mowe of Kamangaui village. Melanesian art , Sydney, 1966, 7. cat.no. 33; 'Bowl. Clay, unglazed, open fired. Carved linear pattern painted black and grey, 5h 12½ diameter, Kamangowi, Sepik River, (collected Tambanum). Used for cooking sago. Collected 1965'.